Well, another week is shot in the backside. As is usual in my world it was another one filled with interesting adventures. As a topper there is the Chillin on Beale Street event this evening, a salute to the automotive orphans, that Cars & Parts magazine. The week began with diligent focus on a goal to complete 12,000 words for the new project, a Route 66 Encyclopedia and atlas. I managed to reach that milestone late Monday afternoon so to wrap this project up that just leaves about 138,000 words, around 1,500 images, at least one trip to Chicago and another to Santa Monica to get those images, and then the writing of the corresponding captions. Much of the remaining free time this past week, as it has for the past couple of weeks, was spent with correspondence ( a formal plea for help as the scope of this project dawned on me). The response by Bill Cadenhead, Laurel Kane, Darlene Bitter, Ron “Tatoo Man” Jones, Debra Holden, Jerry McClanahan, Joe Sonderman, and countless other fans of the double six was overwhelming. For this I am truly grateful. There are two main objectives that I have for this work. One, provide an accurate history of the many facets of this iconic highway from Afton Station to the National Old Trails Highway, from the Harvey House chain to the Route 66 Rail Haven Motel. The second is to make it as current as possible to ensure travelers have the latest information and that those pouring their heart and souls into revitalization or preservation are not forgotten. Of course adequate sales would be nice. The publisher would like to turn a profit and I am not adverse to eating every day or being able to afford a road trip on occasion. I also penned a profile of Ross Judson and his creation, Continental Motors for the monthly column written for Cars & Parts magazine. Giving this gentleman a few minutes in the spot light exemplifies why I derive so much pleasure from writing The Independent Thinker. Mr. Judson is another one of those amazing figures in history that seems to have fallen through the cracks of history. An argument could easily be made that his contributions to the development of the American automobile industry were as great as Henry Ford or Horace Dodge. 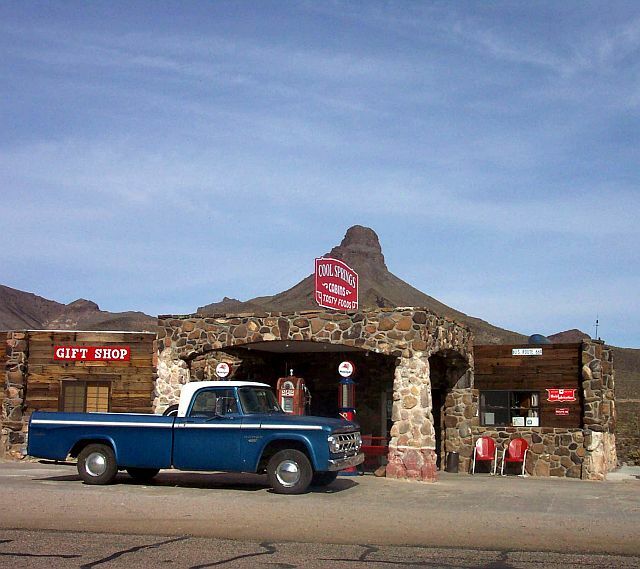 The real job, the one that pays the bills, puts food on the table, and that keeps Barney the Wonder truck (seen here at Cool Springs on the pre 1952 alignment of Route 66 in western Arizona), as well as the Jeep, on the road, and that supports my writing habit, consumed much of the week. Still, it was not without adventure. We had a fellow show up with a truck overloaded by more than 3,000 pounds, not including the overloaded trailer he was pulling, with a complaint about overheating on the drive up from Needles where the temperatures were exceeding 115 degrees! It never cease to fill me with wonder how people can reach fifty or sixty years of age and still have the common sense of an 18 year old. Small adventures dominated the remainder of the week; working on details for the anniversary/photo safari to Prescott and Crown King in September, a California photo safari in early October, and the grand adventure – Amtrak to Chicago, visit my dad in Michigan, a photo safari along Route 66, and participation in the Route 66 festival in Amarillo. That one will most likely be the first week in June, 2011. Of course as most things are in my world, that is subject to change at less than a moments notice.